← Note: It is Possible to Integrate Personality into a Professional, Mostly Neutral Outfit! They’ve been kind enough to share some of their findings with us here today and, not to spoil it for you, but they do see some correlation between choice of library school, and the rank of an employing university. They’ve also been kind enough to include some charts! I love charts. As always, comments are open for your responses. Thanks for reading! This research began as a project for S505: Evaluation of Resources and Services, a course in the curriculum of Indiana University Bloomington’s School of Library and Information Science. I was taking the course at the time, and Michael Johnson, my co-author, had just recently graduated from the program. We had often heard that where you go to school doesn’t matter – it’s the degree that counts. And we decided to put that to the test. We focused our study on academic law librarians, in part because that was my desired profession, but also because Michael found that law school libraries were most consistent about publishing the educational backgrounds of their librarians. Increasingly, academic law libraries seek librarians with both law and library science degrees; thus our research considered education in both degrees. In addition there are standard rankings for law schools and MLS programs, while for other subject masters determining rankings can be difficult because of granularities of specialty. We sought a non-invasive means of conducting our study, so we collected our data solely through publicly-available profiles. The majority of our data came from institutional websites. Where data was absent from institutional websites, we also obtained educational background information from individuals’ public profiles on Google+ and LinkedIn; this only occurred for a few librarians in our study. Because of our desire to make this a non-invasive study, our measure to answer the question of whether school or degree matters more was institutional rank. We compared the ranks of where librarians acquired their library science and law degrees to the rank of the school at which they were employed. We used U.S. News and World Report rankings as our measure since they are most prevalent today; in a few instances, we encountered library science programs attended that are no longer in operation; for these we attempted to find older rankings from other sources, such as the Gourman Report, but where no ranking could be found, we qualified them as unranked for purposes of data analysis. This only occurred in a few instances and had little bearing the results of our study. Michael collected the data for our study. He recorded each librarian’s employing law school and its current rank; the attended law school and its current rank; the attended library science program and its current rank; and the years each degree was attained, if available. Michael performed the initial data analysis on both our intended sample of librarians working at top-fifty law schools and a random sample drawn from all U.S. law schools by calculating frequency statistics. I then followed up with a few chi-square analyses to compare groups of data in different categories. Our study showed that, to attain a position at a top-fifty ranked law school, one should strive to attend a top-ten ranked library science program. 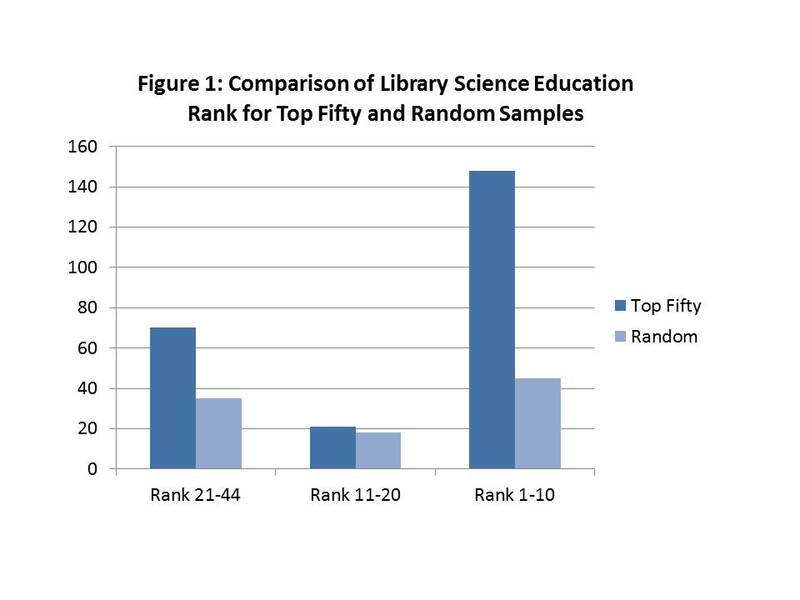 This conclusion was drawn through chi-square analysis comparing the library science education of librarians in the top-fifty sample and those in the random sample. The analysis revealed that those working at top-fifty ranked law schools were more likely to have attended highly ranked library science programs than those in the random sample of all law schools. A similar analysis of law school education of librarians in the top-fifty and random samples yielded surprisingly different results. 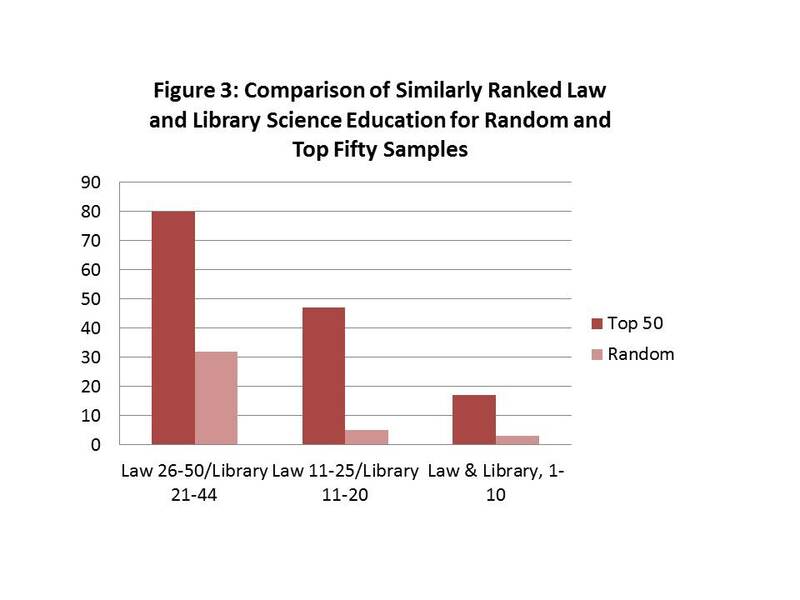 Conducting the same chi-square analysis, we found no significant difference between the rank of law schools attended for librarians in the top-fifty and random samples. However, by more closely comparing librarians working at top-twenty-five and top-ten law schools, the data did reveal a difference in law school educational patterns: librarians working at top-ten law schools were much more likely to have attended highly ranked law schools than those working at law schools ranked in the top twenty-five. In a final analysis, we compared the overall education (library science and law) of law librarians to their current place of employment and found that librarians in the top-fifty sample were more likely to have obtained an overall highly ranked education than those in the random sample. This study explored the question of institutional merit and its potential bearing on employability. It’s safe to say that Michael and I had pre-conceived expectations for what our study would reveal, but it’s also safe to say that our findings surprised us by not reflecting our expectations! It would have been natural to expect one degree to stand out as more significant for employability in this field than the other; however, we found that each degree held its own importance: if one’s ambition is to attain a position at a top-fifty law school, the rank of the library science program seems to be most important; however if one’s sights are set on working at a top-ten ranked law school, the rank of the law school attended becomes just as significant. 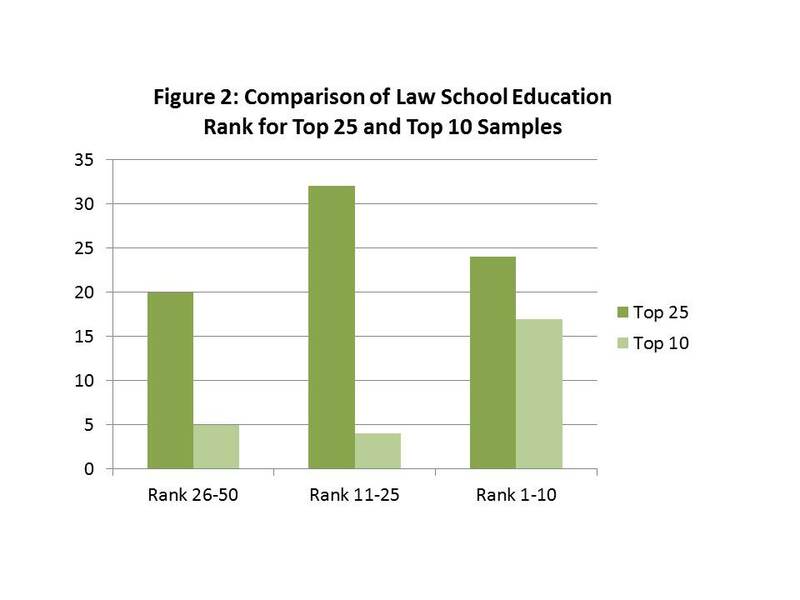 And indeed, while the rank of law school education alone did not seem to be significant between our top-fifty and random samples, it appears that this rank cannot be ignored – our analysis of overall education revealed that those working at top-fifty law schools were more likely to have attended both higher-ranked law and library science programs. While the results of this study seem to suggest choices one should make if pursuing the education to become a law librarian, it is important to acknowledge the limitations of the study as well. In our efforts to conduct the study in a non-invasive manner, we were limited in the data we could obtain and analyze: not all schools post their librarians’ credentials; some post more data than others; and we elected not to contact librarians in our samples in any way, thus limiting us strictly to our quantitative analysis. Certainly, other factors such as personality and technical skills inform hiring decisions at any library. In fact, we conducted a separate analysis during this study of law library directors alone, and were unable to draw any significant conclusions; although some certainly had very high educational credentials, this was not always the case and analysis did not reveal this to be a significant pattern. Clearly there is some other factor that informs the qualities of a directorial candidate. Our study is not, therefore, a predictor of hiring outcomes. But for those interested in a career in law librarianship, our study does suggest considerations that should be made when applying to library science and law programs. 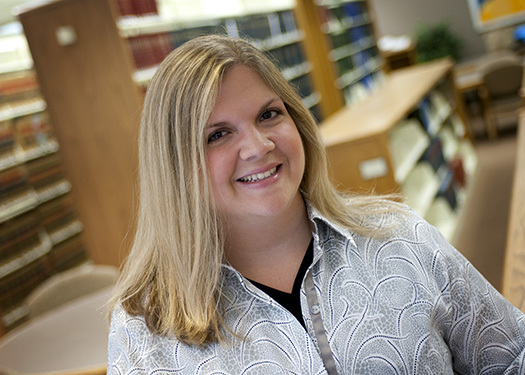 Ashley Ahlbrand is the educational technology and reference librarian at Indiana University Bloomington’s Maurer School of Law. Her research focuses on social media and other emerging technologies and the ways in which they can be and are used by law libraries and law faculty for teaching purposes. Michael Johnson is the circulation librarian at Shawnee State University. His research and professional interests are citation analysis, science librarianship, information visualization, big data, library usage and career influences.